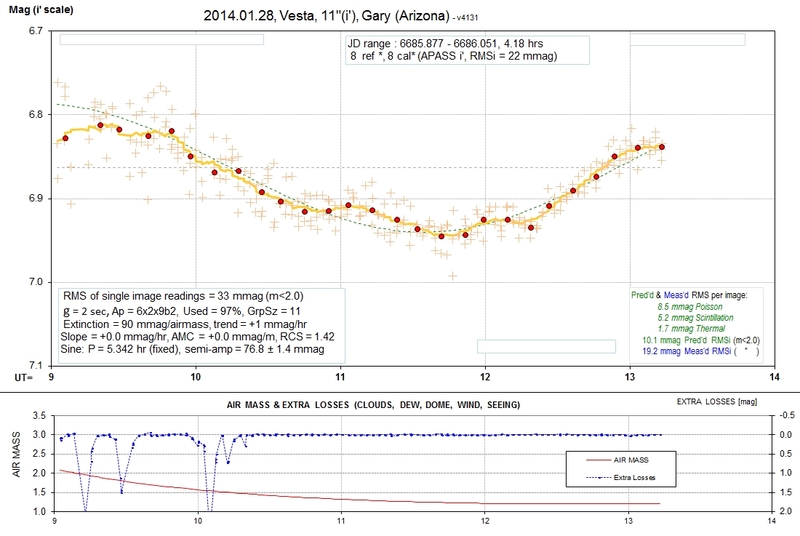 This web page is where I will archive my multi-band LC observations of Vesta. 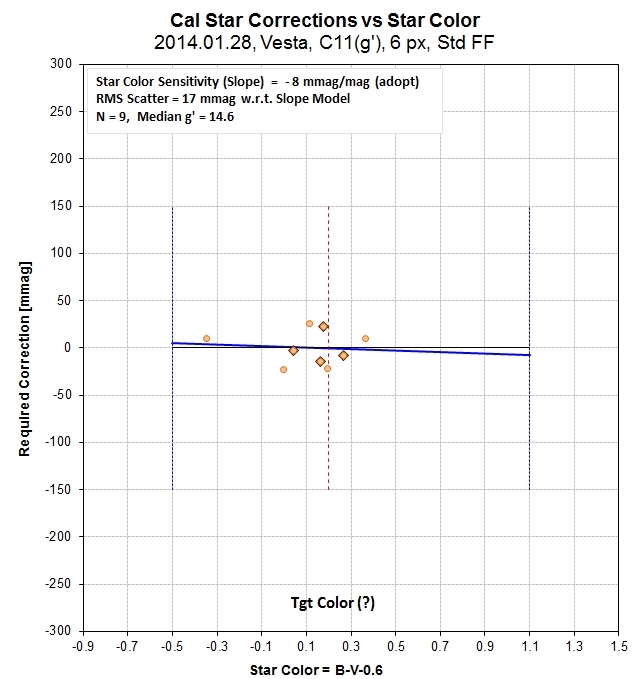 This web page will document multi-band rotation LCs of Vesta. The goal is to evaluate the spectral energy distribution (SED) as a function of rotation phase. The following is a summary of observations. Key: C11 = Celestron 11-inch, M14H = Meade 14-inch with Hyperstar. This project appears to be feasible, even with my Celestron 11-inch (C11) telescope. It is already obvious that the Meade 14-inch with a Hyperstar (M14H) should be significantly better. This is due to its larger FOV, allowing for more stars with a brightness comparable to Vesta to be used for photometry calibration. 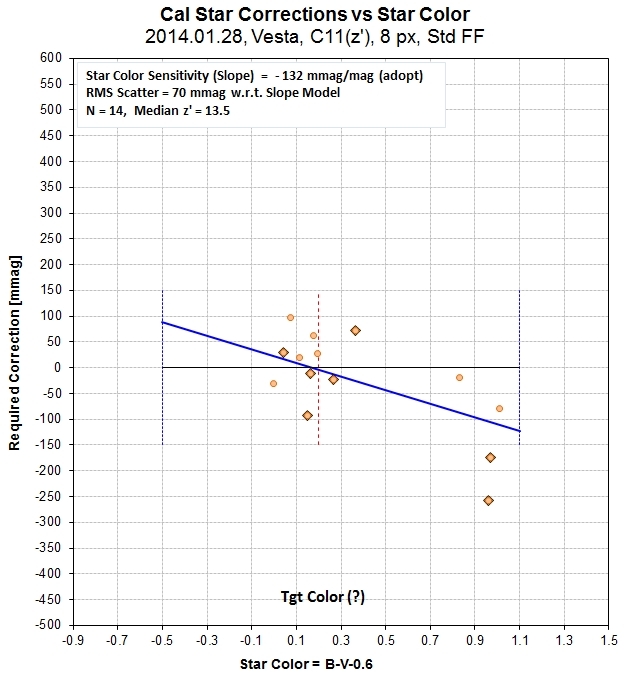 The C11 feasibility observations had only one star that was within 0.5 mag of the same brightness as Vesta, all the others were much fainter, which meant that Poisson noise from the reference stars dominated precision. M14H has a FOV 4.8 times larger, so it will have a greater probability of including suitably bright stars for reference. Another source of uncertainty is scintillation since exposure times for filters Bg'r'i'z' were 2, 1, 2, 5 and 15 seconds (to prevent Vesta from saturating the CCD), and this meant that scintillation noise was large. Thermal noise was always so small as to be irrelevant (i.e., there was no need for additional CCD cooling). The following set of LCs are for B, g', r', i' and z' bands. Sinusoid fits (chi-sqr based) are shown. The longest wavelength departs the most from a sinusoidal fit. APASS stars were used to establish the magnitude scale. The information box (top, center) shows how many stars were used for reference and how many were used for calibration. An RMS off the calibration fit is also noted (more info about this below). An information box (lower-left corner) shows the RMS that would be obtained for averages of 10-minute intervals if only that one filter was used throughout the observing session. Typical values are 2.5 mmag. This box also shows exposure time (denoted by "g" for gate time), photometry apertures [pixels], percent of data that was accepted, number of data in group averages, extinction, model fit slope and "air mass curvature, reduced chi-square (RCS), model sinusoid period and amplitude (with chi-sqr based SE). The information box in the lower-right corner shows predicted RMS per image (green) and measured RMS per image (blue). The predicted RMS consists of 3 components, also given. B-band magnitude scale is estimated to be accurate to 17 mmag. 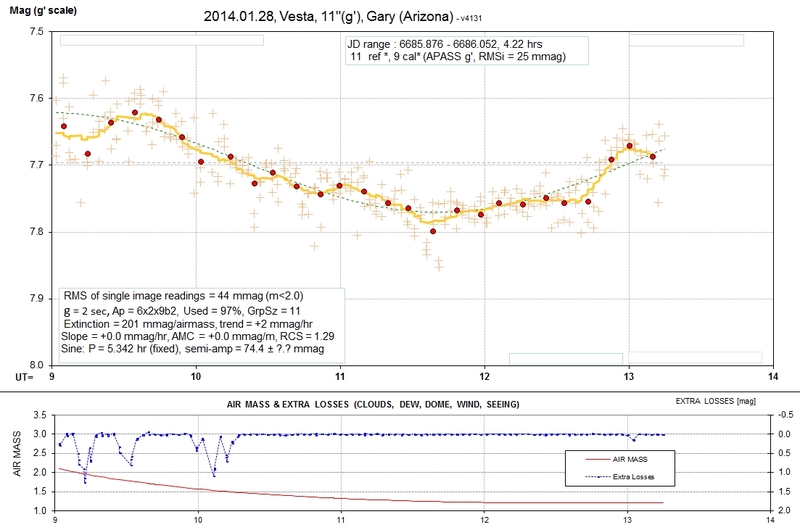 g'-band magnitude scale is estimated to be accurate to 17 mmag. r'-band magnitude scale is estimated to be accurate to 18 mmag. 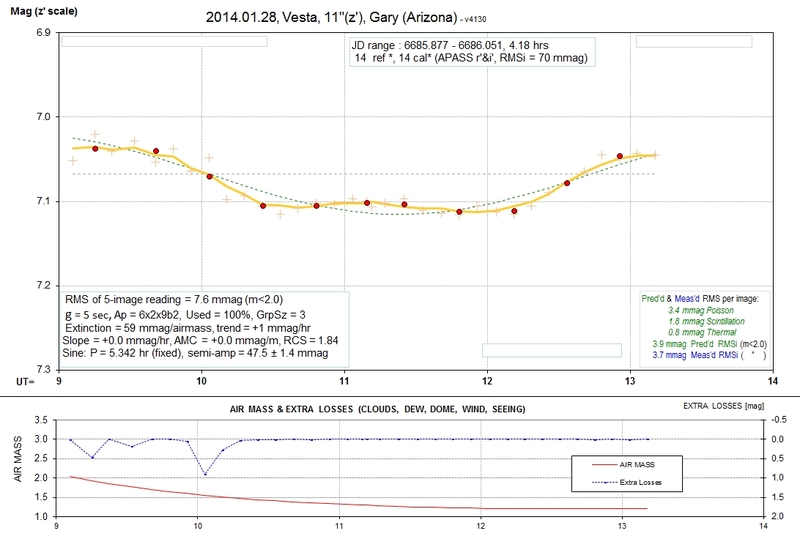 r'-band magnitude scale is estimated to be accurate to 17 mmag. r'-band magnitude scale is estimated to be accurate to 25 mmag. Departures from sinusoidal fits are evident, and the departures resemble each other at all wavelengths. Below is a plot illustrating one example of establishing a magnitude scale for observations with one filter (g' for this example). The slope (vs. star color) allows for the fact that my system's spectral response function will depart slightly from the standard used for defining the magnitude system. The RMS off this fit, combined with the number of stars, provides a means for estimating the accuracy of the magnitude calibration for the target; typically, I'll add 15 mmag in quadrature with the RMS off the fit for determining target magnitude accuracy. For example, using the example below, 17 mmag and 15 mmag yield 23 mmag, which is my estimate for the g'-band magnitude scale accuracy. Plots used to establish calibration for g' (left) and z' (right). 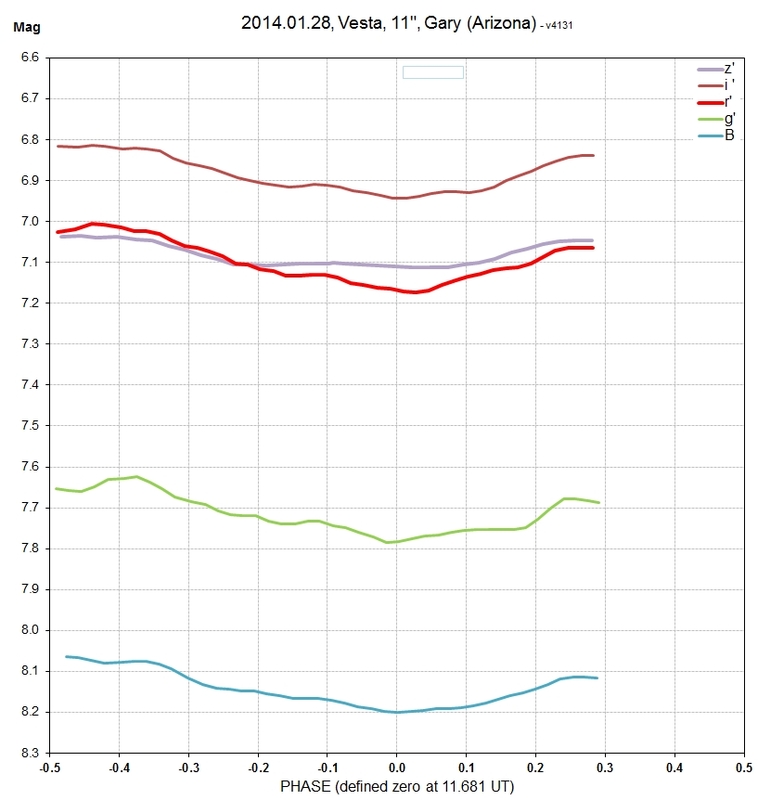 Running average magnitude versus phase for 5 bands. Below is a plot of sinusoid amplitude versus wavelength, showing a maximum at r'-band. Rotation variation amplitude vs. wavelength. 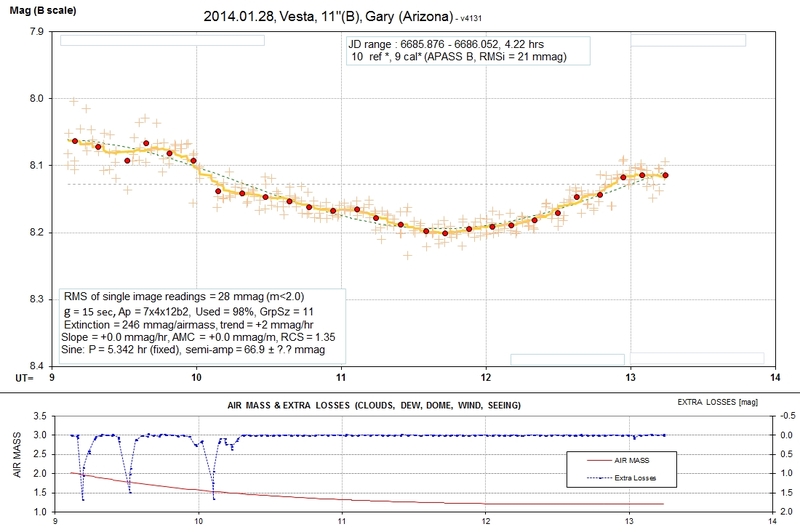 The greatest variation occurs at r'-band. 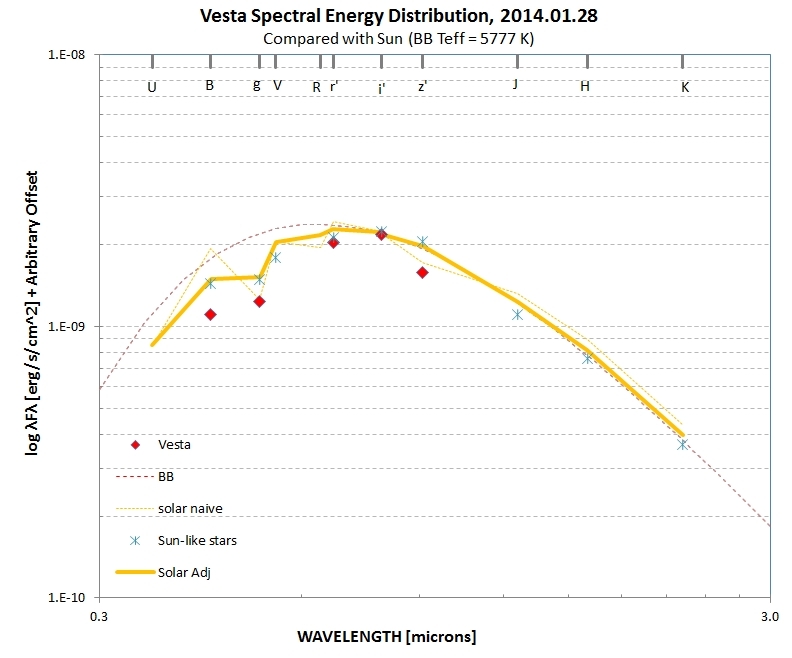 Vesta SED for phase -0.40 (arbitrary offset). The greatest albedo is at i'-band. 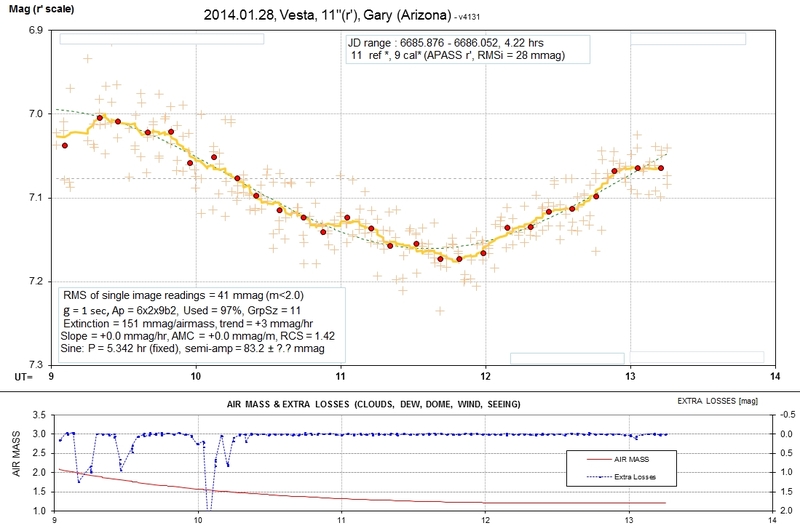 An albedo drop occurs at z'-band. 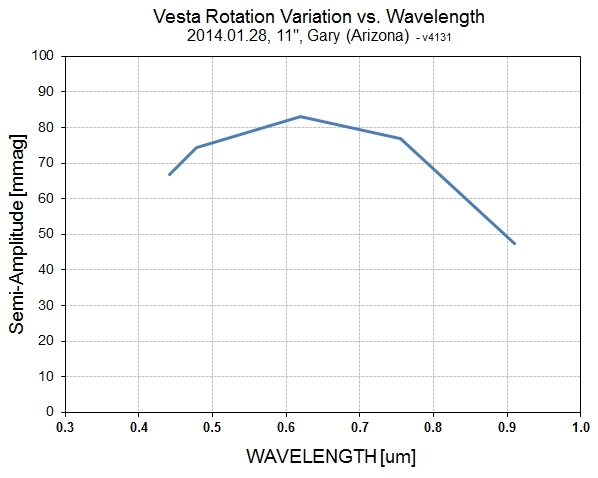 Vesta reflectance vs. wavelength for 4 phases.